People walk by a gruesome scene Friday -- a man facing up, with arms out -- on John Brown Avenue after a mob left. 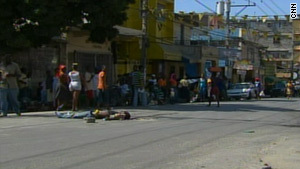 Port-au-Prince, Haiti (CNN) -- In the middle of the street lies a young man who appears to be dead, a pool of blood beneath his head. A large concrete block is next to his shoulder, with shattered pieces of it around him. Blood trickles down the road. Witnesses say he was a thief trying to steal people's money Friday amid the chaos from last week's earthquake. "This is robbery. He went to rob the people. He went to steal money -- American dollars," said a man at the scene who identified himself as Frederic Mano, a Haitian sportswriter. "The people kill him with the blocks, because the people are angry. They are not hungry, they are angry," Mano told CNN's Lisa Desjardins. Gruesome photos from the scene show the man facing up, with his arms out to the side. He is wearing socks but no shoes. A second concrete block is a few feet away from him. The people kill him with the blocks, because the people are angry. They are not hungry, they are angry. Mano said the young man was one of several thousand prisoners who escaped after the earthquake struck. He did not deserve to be killed, Mano says, "but anyway, he's dead. That is destiny." Other witnesses gave a similar account. They said they believed the man was a thief and might have been a prisoner who escaped. In Haiti at this time, there is no immediate way to confirm the man's identity. CNN learned of the situation when a Haitian approached a CNN crew. "Do you want to see an example of citizen justice?" the man asked. He said a man had been stoned to death by an angry mob. By the time CNN arrived on the scene, the crowd had mostly dispersed. Some people stood on the side, looking at the young man in the middle of John Brown Avenue, which is usually one of the busiest streets in the capital city. There are no operating shops on the street. But there are many vendors selling items from tables or carts. The incident took place near the Champs de Mars, the capital's central plaza that has turned into something of a tent city. It was just a few minutes' walk from CNN's bureau. As the body lay still, some vehicles drove by on each side. CNN's Alec Miran contributed to this report.